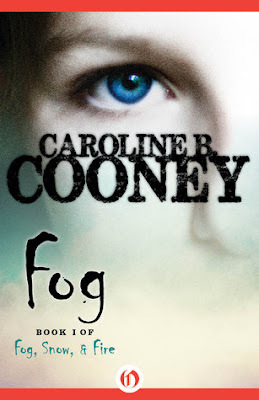 Christina Romney (lol, bad time to read about a character with that name) lives on a small island off the coast of Maine, called Burning Fog Isle. She's about to start grade 7, which means boarding on the mainland. Christina is excited to experience mainland life, but her older friends, who have been there before, warn her that everyone teases island kids. When they get to the Schooner Inne, where they'll be boarding, the home of the principal and his wife, things immediately start to go poorly. Mrs. Shevvington is awful, and accuses Christina of having a bad attitude whenever she questions anything. Mr. Shevvington seems nice at first, but becomes increasingly disturbing as he makes everyone around Christina doubt her sanity. This book turned out to be something other than I expected. It's very much a psychological horror story. It's kind of weird because it's written for pre-teens, yet it's filled with what is basically emotional torture. So, I enjoyed it, and found it terrifying, but I'm in my 20s. But then, I don't usually understand age guidelines. Anywho, at times it's suggested that the sea is what's out to get them, and that's rather creepy in itself, but most of the time I found it clear that the Shevvingtons were the ones to be worried about; they were straight up horrifying. This is one of those stories that really makes me feel the character's pain. Every time someone doesn't believe her, or becomes convinced she's crazy, I just wanted to yell at them. It was very powerful. I think that's one of the scariest things a horror story can be about: your loved ones turning on you because they think you're the bad guy. 5 stars. The night I finished it, I was up half the night because I could not put it down.